September 1798, can be considered the month when the first form of autonomous Maltese armed battalions were ever formed. 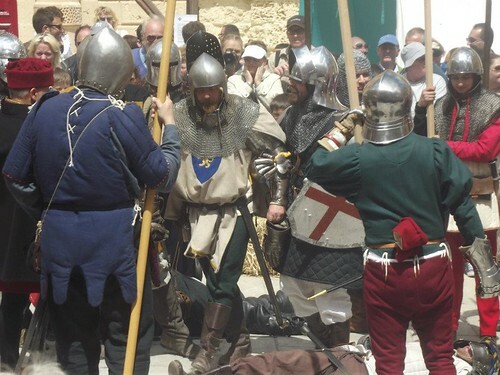 The military experience the Maltese had been through the times of the Order of St. John, enabled them to organise the battalions of armed men and surprise the French occupying forces. This led to the success of the liberation of Mdina and the subsequent ambushes on French positions and relief columns, procuring themselves guns and muskets. In the evening of the 3rd September 1798, the day of the liberation of Mdina, the large crowd which gathered at Rabat appointed by acclamation, Notary Emmanuel Vitale as the leader of the free Maltese. The next day, on the initiative of Father Peter Paul Micallef, provost of Birkirkara, and Canon Michael Dimech of the Cathedral Chapter, the senior members of every village gathered at Mdina Town Hall to form a National Assembly. Their purpose was that of planning and co-ordinated all future efforts against the enemy and to find ways and means to get help from abroad. The first task of the Assembly was to elect the Supreme Commander of the Maltese forces, the four deputies representing the Maltese population and the commanders of the village battalions. Notary Emanuel Vitale was confirmed Supreme Commander, the four deputies being Count Salvatore Manduca, Marquis Vincenzo Depiro, Count Ferdinand Theuma Castelletti and the same Vitali. Lorenzo Bugeja secretary of the assembly, Mudest Sapiano in charge of artillery, Joseph Azzopardi in charge of corn supplies, Gaetano Vitale and Peter Paul Bezzina in charge of food supplies, Paul Galea and Vincent Muscat in charge of wheat issued daily to make bread, Aloisio Xuereb to act as liaison officer between the various camps of the forces, Joseph Muscat in charge of the coastal watch-towers, Paul Galea and Vincent Muscat in charge of bread distribution. They gave directions how to organise village battalions and how these should select their leaders. The villagers from Haz-Zebbug and Siggiewi who had already chosen Canon Caruana, Cachia, Bonanno and Brignone as their leaders, did not take part in the National Assembly. A Command base was also set up in Casa Leoni in St. Joseph, Hamrun. By the 5th September, each village raised its battalion of volunteers and collected money for their upkeep. This money was collected from all those who had the faculty to donate funds or that recovered from the crops given as quota from the rest of the villagers. ach Maltese Battalion had a number of full-time soldiers regularly paid and given bread and olive oil as ration. These were normally unmarried men who had served in the Order’s regiments as soldiers, fleet marines or sailors. Sailors who had their crafts lost in Valletta Harbour and could not operate as such joined the ranks of these regulars. The battalion was commanded by the village commander assisted by an adjutant to the commander, sergeants and corporals. It was divided into four companies each company having three platoons. Each platoon had a sergeant, a corporal -sometimes two sergeants or corporals, and between 13 to 17 privates. There were around 200 men in each battalion. The battalion was served by a surgeon or a doctor and a chaplain. There was also the guard platoons one-half of which was stationed on the roof of the churches or similar posts. This platoon was composed of one sergeant, one corporal and 12 privates. Another guard platoon was stationed normally at the entrance of the camp; this had had a sergeant a corporal and some 20 privates. The Village Battalions had also a military band with a bandmaster and some 12 bandsmen, including two drummers. Battalion of Birkirkara had its men kitted out with white cotton jackets with red facings and black coloured cylindrical shaped hat of felt, with cockade and button attachments on the left side. Gunners at the batteries wore red or blue coloured ‘milsa’ and waistband. Corsican style hats with one brim held to the crown were also worn. Assault companies had their clothes dyed dark blue or black, as most of the approaches to French held lines were done during the night. The soldiers were issued with captured French muskets, and cartridge boxes- coming from the prizes brought by the English Admiral Sir James Saumarez, after the battle of Aboukir Bay. Cartridges and gunpowder were distributed to each soldier. Each man had to have a supply of 20 cartridges available when going in for service duty, which was divided in two watches, with two guard platoons on duty for two consecutive nights and two days respectively. The Birkirkara battalion, formed by village volunteers from Birkirkara and Mosta, was typical of the other Maltese village battalions which were formed in these days. It had as its commander Vincenzo Borg Brared, a cotton merchant by profession, with Doctor Leopold Bernard as his second-in-command. Francesco Borg was camp major and Francesco Pace his adjutant, the other members of the staff were Surgeon Vincenzo Casha, Quatermaster Vincenzo Calleja and his assistant John Mary Pace, Clerk Giuseppe Onofrio and his assistant Fortunato Micallef and Father Joseph Micallef of the Franciscan Conventuals as battalion Chaplain. Thirteen other volunteers served as artificiers, gunsmiths and watchmen. The infantry section had 14 officers, 32 sergeants, 30 corporals and 325 privates. The artillery section had 8 officers 17 sergeants 14 corporals and 83 gunners, All these men served throughout the two-year war. Zejtun: Joseph Abela and Peter Manueli -Tal-Borg; Francis Miceu St. Roque battery, Anthony Camilleri at St.Lucian Tower. There were also Angelo Debono at St.Thomas Tower and Gio Batta Rebull Commandant of the assault companies. Haz-Zebbug: John Andrew Trevisan, Anthony Attard,Anthony Manduca Fr. Anthony Baldacchino, Andrew Pavia, Joseph Agius, Philip Attard, Louis Zarb. B’Kara: Vincenzo Brared,Dr.Leopold Bernard, Francis pace, Joseph Scicluna, Francis Zammit, Ignazio Cutajar and Francis Borg As the senior officers amongst 188 of this battalion. In 1799, The Maltese Assembly appointed Captain Alexander Ball, RN, as it’s president and Ball’s attendance as such took place on Monday 11th February at a session held at Vitale’s house in Rabat. The session was attended also by Canon Caruana and all the commandants of the Maltese battalions. Eventually, Ball proposed that the Assembly should be henceforth being called a Congress and be composed of a delegate as bishop’s representative, a judge chosen by the elected village representatives, and a village representative elected by the heads of families of that particular village. Canon Caruana and Vincenzo Borg –‘Brared’ the two commanders of the village forces, were to be members of congress. Advocate Felix Cutajar private secretary of Brared, who understood French fluently, became Ball’s secretary. On 4 September 1800, Captain Ball informed the committees of the various villages of the glad tidings that the enemy had surrendered. On the day of the capitulation the village battalions had 2,505 men between officers and privates who occupied the advanced posts; Captain Ball their supreme commander; Theodore Cardona, the commander of Hal-Tarxien Battalion, was the lieutenant colonel while Peter Cardona, who happened also to be an officer in a Sicilian regiment and Pasqual Gauci, were his adjutants. In that number were also included the artillery companies, a few doctors and medical assistants and some chaplains. On the 11th September 1800 Captain Ball issued the following order: ‘Since we are rid of the enemy and there is no further need of the battalions, everyone is at liberty to return home and the battalions are hereby disbanded’.